Deutsch, James I. "'I Was a Hollywood Agent': Cinematic Representations of the Office of Strategic Services in 1946." Intelligence and National Security 13, no. 2 (Summer 1998): 85-99. "In 1946,... three Hollywood feature films were released that dramatized the agency's operations during World War II: O.S.S. (Paramount Pictures[)], 13 Rue Madeleine (Twentieth Century-Fox), and Cloak and Daggers (Warner Bros. Pictures). Although officials in the War Department w[e]re often disturbed by many of technical details that these three films revealed about the military, the intelligence establishment generally benefited from the the largely positive publicity and box-office success that these films received." According to a report published in Der Spiegel, the BND "has admitted covert surveillance ... in the Afghan capital" of the communications of the Bonn-based relief organization Welthungerhilfe. " The BND had told Welthungerhilfe it had scrutinized at least 2,000 e-mails, fax messages and telephone conversations from the Afghanistan NGO Safety Office (ANSO) between October 2005 and April 2008." de Valk, Giliam. Dutch Intelligence: Towards a Qualitative Framework for Analysis, with Case Studies on the Shipping Research Bureau and the National Security Service (BVD). Rotterdam: BJu Legal Publishers, 2006. Peake, Studies 51.1 (Mar. 2007), finds that the author's "study is impressively documented," but the conclusions point to "outcomes [that] are standard measures in most services." In addition, de Valk "has yet to validate his approach using an extensive database." Gade's "most notable entry in the annals of US intelligence was his prescient recommendation, made in 1929, to establish a national intelligence organization to coordinate intelligence activities and provide analysis of international developments.... [T]he Gade proposal was deemed unrealistic and promptly shelved. Decades later, it became prophetic." Devereux, Tony. Messenger Gods of Battle. Radio, Radar, Sonar: The Story of Electronics in War. London: Brassey's, 1991. Herman, I&NS 7.2, takes issue with the author's conflating of "electronic warfare" and "electronics in war" and his inclusion of sonar in his subject. Nevertheless, the reviewer notes that, for those new to the subject, the book is "a good exposition of physical principles and the technological history." De Villemarest, Pierre. Le Coup d'Etat de Markus Wolf: La guerre secrete des deux Allemagnes. Paris: Stock, 1991. De Villemarest, Pierre. GRU -- Le plus secret des services sovietiques, 1918-1988. Paris: Stock, 1988. Rurarz-Huygens, IJI&C 3:1: "[F]rom its beginning the GRU was solely an intelligence gathering organization and not like the KGB, an instrument of internal repression.... While ... admirable in bringing to light many interesting facts about the GRU's history, [this book] does not place the GRU within the Soviet power structure." Devlin, Larry. 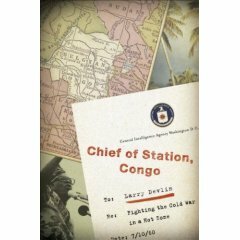 Chief of Station, Congo: A Memoir of 1960-67. New York: Public Affairs, 2007. Lawrence Raymond Devlin died 6 December 2008. Joe Holley, "Larry Devlin, 86; CIA Chief of Station, Congo," Washington Post, 13 Dec. 2008, B5. Clark comment: This is an invigorating read about a curious corner in the Cold War, written by a man who lived it closely. There is certainly plenty of Devlin's opinion on U.S. foreign policy of the era spread about in his memoir, but such does not represent more than momentary pauses in the narrative of the story he unfolds. This was neither the first nor the last time that officers (whether CIA or State Department) in the field and Washington had different views of developing situations. Devlin writes an easily read brand of English, introduces his colleagues and the Congolese leaders with both candor and sensitivity, and seeks to put to rest canards directed at the CIA institutionally and him personally for such actions as Lumumba's death and Mobutu's coup. It is, perhaps, easy at this late date to wonder "who cares" about these actions of long ago; it is, however, even easier to agree with Devlin's deepseated belief that it really did matter at the time. I am grateful that fate placed Larry Devlin in the Congo at this juncture as Africa began to move beyond its previous colonial existence. EAB, AFIO WIN 06-07 (12 Feb. 2007), notes that when the author arrived in the Congo in 1960, there was "no central authority ... and local strongmen were struggling for power.... Devlin devotes a large portion of the book refuting his or the agency's part in Lumumba's death." Similarly, a Publisher's Weekly reviewer (via Amazon.com) finds that the author uses his last chapter for "a point-by-point refutation of his or the agency's involvement in Lumumba's death.... Devlin's straightforward, plainly written approach ... lends credence to his assertion of innocence." For Cassilly, IJI&C 21.1 (Spring 2008), "this is the first report written exclusively from the CIA's point of view and, as such, a valuable contribution to the history of the time.... [A]s the Cold War recedes further, the time may soon arrive for a reexamination of the situation in a less emotional context. When doing so, Devlin's book will be required reading, if perhaps not the final word." Rogers, CIRA Newsletter 32.1 (Spring 2007) and Intelligencer 15.2 (Fall-Winter 2006-2007), calls Chief of Station, Congo "an important piece of history about the United States' skirmishes with the Soviet Union and other Communist countries during the Cold War as specifically played out in the Congo.... The Congo experience is a textbook lesson on how CIA can and should work with the Department of State, and how Department of State diplomats can use effectively intelligence resources." See Scott Shane, "Memories of a C.I.A. Officer Resonate in a New Era," New York Times, 24 Feb. 2008, for the journalist's interview of the 85-year-old Devlin at his home in Virginia.